Wow, this is seriously the best book I've read in a very long time. I was told that it was good, but I really had no idea that it would be this phenomenal. This book has the most phenomenal world building. 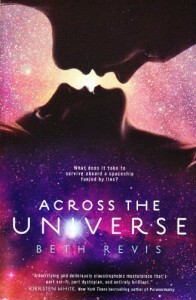 Beth Revis created a world that was so futuristic and realistic at the same time. The descriptions were great, I could visualize everything without the book being bogged down with details. I absolutely loved the science aspect of this book. I don't want to give any spoilers, but this book was like giving a toy to the scientific part of my brain. I'm greedy and I want more. I can't wait to read the sequel. I really don't know how to review this book besides to say: IT'S AWESOME AND YOU NEED TO READ THIS IF YOU HAVEN'T. I might return to this review later once I get over how epic the last 50 pages of the book were.